This hostel is the best place to stay in Split!! The staff are FABULOUS and its so cosy, youll feel right at home!! The location is perfect, right in the middle of town and close to the bus station, such a good place to stay for a great price!! I had so much fun here, its an amazing hostel and I will definitely be coming back!! Really good place if you want to meet new people and Arthur the cat is just the best! I cant recommend it enough, extended my stay in Split because I didnt want to leave! The hostel have a very good location, good price, good environmental. They are lovely people, Dario was very kind with me, If I go again to Split of course I would me host there. Best wishes from Chile. 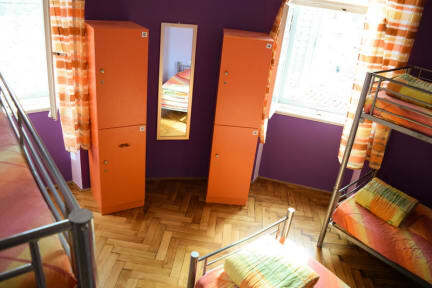 What makes any hostel exceptional? Great staff! That is exactly what we found at Old Town Hostel in Split. We had great recommendations for food and activities, in addition to good company. Small, clean, cozy. Doors tended to be unlocked but this didn't seem like an issue; sheets, towel, locker with lock all provided. Would definitely stay again. Absolutely great! Only thing is there's only 2 bathrooms which sometimes can be a problem. The hostel is in a great location. There are only 2 bathrooms but the hostel is small so I don't think this would be too much of an issue even in high season. The kitchen has the basic things you need. The bedrooms are kind of small but they do have lockers in there. My biggest issue was that all the plugs were in one corner of the room, not close to any of the beds, which makes it pretty uncomfortable. The place is dirty, reception is never there, it's extremely cold, and there are only 2 bathrooms. I do not recomend this place.